Every now and then I get to do something even more exciting than my typical day’s work. This time I get to collaborate with Dr. Kimberley Thornton, M.D., a highly revered Reproductive Specialist from RMA of New York. Together we decided to draw from our own experiences and offer an East/West perspective on this perplexing illness, P.C.O.S. As an Acupuncturist and a Reproductive Endocrinology and Infertility specialist, both of us treat a sizable number of women with polycystic ovarian syndrome (PCOS). Those affected by this disorder fall within a range of symptoms and severities, and now with the information available to us (via internet), more women are feeling less alone when enduring the symptoms of this perplexing disease. Polycystic Ovary Syndrome (PCOS) is an endocrine disorder that affects as high as 15% of women of childbearing age, and is a health problem that has affected as many as 5 million women in the United States alone (WomensHealth.gov). We have not been able to pinpoint what exactly causes PCOS, and although the symptoms of this disease are exhibited primarily through a woman’s reproductive system, this disease is foremost an endocrine issue. The overproduction of androgens “male hormones” prevents the body’s ability to regulate insulin, as well as the proper development and timely release of eggs during ovulation. Women typically present with irregular menstrual cycles and hirsutism (excessive hair growth), but the phenotypic expression is variable. On work up for the disease women often have “polycystic appearing” ovaries on ultrasound and elevated androgen levels in the blood. Eastern Medicine embraces the viewpoint that by receiving regular acupuncture treatments and enhancing a balanced diet, one can also contribute to the treatment of PCOS. Acupuncture and Chinese medicine are designed to stimulate the body’s own natural production of hormones and regulate the menstrual cycle by gently correcting underlying deficiencies. Reduce stress and influence healthy ovulation. Acupuncture is a very effective way for PCOS sufferers to naturally manage their hormones and enhance fertility. In turn, it also reduces their risk of cancer, diabetes, hypertension, high cholesterol, and other long-term health conditions which may also stem from this very complex disorder. 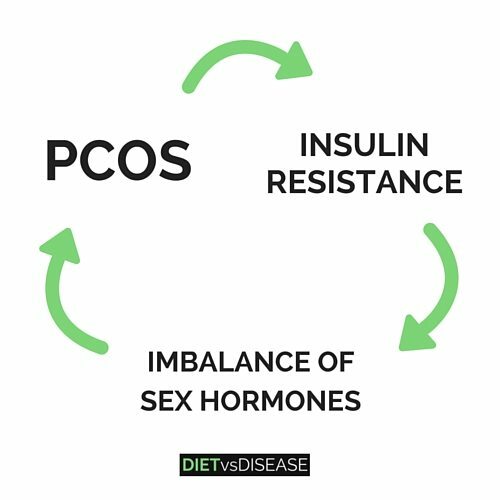 Diet and lifestyle modifications are the foundation for PCOS management, but many women suffering from PCOS may still need to turn to Western Medicine while trying to get pregnant. Women with PCOS commonly do not ovulate on a regular basis and suffer from infertility. Sometimes medications called Clomid or Letrozole are used to help women with PCOS ovulate regularly. These medications help increase the natural hormones from the brain that tell the ovaries to grow an egg each month. This in turn helps overcome the ovulatory dysfunction seen with PCOS and increases the chance of pregnancy. Both Letrozole and Clomid are most effective when combined with lifestyle modifications. If you or someone you know suffers from PCOS, or infertility resulting from PCOS, be sure to know that you are not alone. Remember both Eastern and Western medicine, especially when combined together, are powerful tools to help manage the symptoms of PCOS and infertility that is commonly associated with it.